$12.00650 points plus $6.00FREE with 2,050 points! 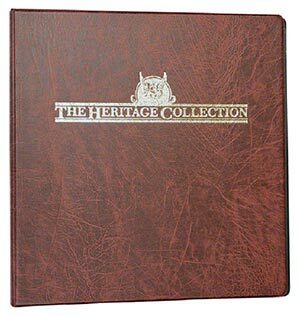 Mystic’s Heritage Collection 3-ring binder provides protection for you to organize and display your stamps – especially helpful if your current Heritage album is becoming crowded or you want to include additional formats in your collection. The custom-made “lay-flat” design makes it easy to mount and view your stamps with plenty of room to add lots of pages and annual supplements. 2" binder with rich golden lettering.